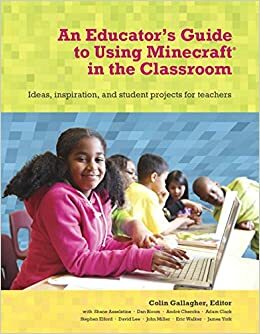 When I started the Minecraft class in my school I never set out to drill into students to try and think about using Minecraft in their learning. I knew that is my end goal but for now it was finding the ground work, ironing out creases, and creating the environment. One of the seeds of a project in my head for the students was to create a model of the school during the latter stages of the class. Within the first few weeks a grade 5 student, Anton, beat me to it and he built a model of our elementary school within a couple of days! Was it exactly to scale? No. Did I care? Not a bit! You can see the school in this video I recently included in a post. Minecraft Walkabout: Week 4 from Colin Gallagher on Vimeo. Running in conjunction to our class the grade 5s started their PYP Exhibition on Human Migration (Where We Are In Time And Place unit of inquiry). Anton’s group was tackling the migrant community in our school; who they were, where they come from, and what they bring to our community. One day Anton came to me and said he wanted to use the school model he built in Minecraft for his exhibition. He would write a script and direct some students (and me!) in various scenes around the school. I basically facilitated the use of Jing on my laptop during one break time and he did the rest. Another student got us all appropriate skins! I must say when the group of students came in to me one day I didn’t hold out much hope. We had twenty minutes to get the scenes but Anton quickly directed us in what to do, where to do it, and when. He did a fantastic job. Anton’s PYP Exhibition Video from Colin Gallagher on Vimeo. Students from other schools visiting Anton’s booth at the exhibition were astounded he was “allowed” to use Minecraft in his project. I hope those students left with some inspiration and ideas for their own exhibition! The scope for using Minecraft is mind-boggling. I hope to use it in Grade 3 next year for their PYP unit “How We Organize Ourselves” in which students look at systems and how they operate in their daily lives. The broad outline of my plan is that each class will create a town/city on our Minecraft world and each class will have groups responsible for different “systems” in their city eg. education, sanitation, public safety. Their summative assessment will be the culmination of their city planning and what systems they have in place and which they deem necessary….I hope!